The Anaheim Convention Center hosts the annual NAMM Show. I spent the better part of a week at the 2016 NAMM Show in Anaheim, CA, taking in as many sights and sounds as possible, stretching from Media Preview Day (Jan. 20) through a late night performance from alternative-Americana singer-songwriter Michael Ubaldini that wrapped up just before midnight on Saturday, Jan. 23. Here are some highlights from this year's amazing National Association of Music Merchants show, better known as NAMM. Over the course of a few fast-moving hours, a number of exciting new products were showcased for reporters, photographers and news crews. NAMM Show during Media Preview Day. One of the most exciting debuts on media preview day came courtesy of the Kadabra by Israel-based Tribal Tools. 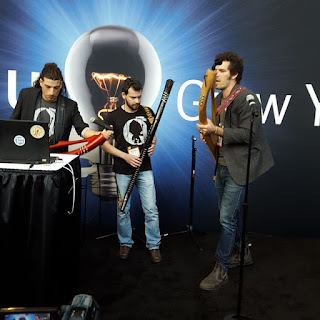 A trio of musicians took the stage and performed on the unique wireless instrument in something that combined world music with sci-fi synth sounds; the ergonomic design also has an adapter and can be outfitted with a microphone so the musician can sing while playing the instrument at the same time. 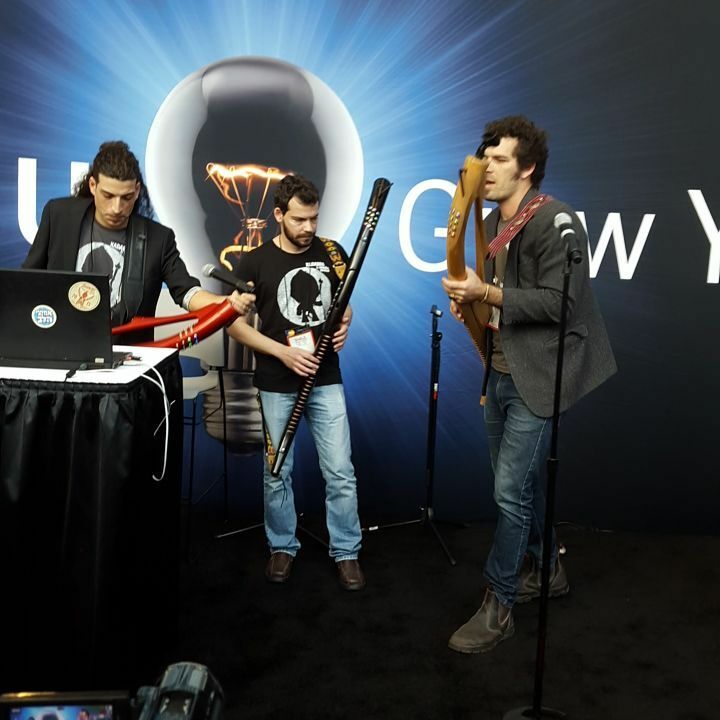 Tribal Tools presenter Moshe Yoffe explained that the Kadabra combines high-tech electronics, motion sensors, a sleek design and smart algorithms to allow players to expand their musical expression. Information: Tribal-Tools.com. The 660 Guitar weighs in at 7 pounds and has an aluminum body with a carbon fiber/graphite neck. According to the makers of the guitar, it is practically indestructible and has a sound that is as rich as other top-tier electric guitars in the marketplace. It retails for $2,995, and comes in a number of sleek designs and colors. Performing with the guitar was Zebrahead guitarist Dan Palmer. Every order comes with strap locks and a low-profile guitar case. Information: 660guitars.com. In celebration of John Lennon's 75th birthday (the Beatle would have turned 75 on Oct. 9, 2015), C.F. Martin & Co. debuted the Martin D-28 John Lennon 75th Anniversary Edition guitar. The legendary guitar maker is also celebrating the 100th anniversary of its iconic Dreadnought model by unveiling the Martin D-222 100th Anniversary Edition acoustic model. Information: martinguitar.com. 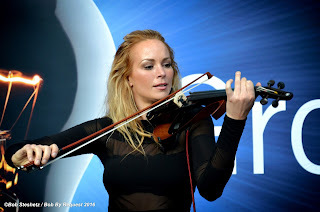 Famed violinist Caroline Campbell (Andrea Bocelli, Sting, Chris Botti) was brought out to showcase a new Yamaha Electric Violin; as impressive as that state-of-the-art YEV series instrument was it was one of only 100 new music-related products introduced by Buena Park, CA-based Yamaha at this year's NAMM Show. New products include high-tech digital mixing consoles, the Disklavier Enspire piano and much more. Get more information on Yamaha's range of new products that made their debut at NAMM here. Taylor Guitars was able to showcase two exciting products. Taylor Master Guitar Designer Andy Powers shared with me about the company's 12-Fret Guitar Revival. "This year (2016) we are re-evaluating and reconsidering our heritage. Some of Taylor's 'first hit singles' were 12-string guitars," Powers said. Taylor set out to offer an expanded suite of player-friendly 12-fret models for 2016 (the design and production of the 12-string revivals has been in the works for approximately 2-1/2 years). This writer had a chance to play the all-Mahogany 562ce 12-Fret guitar and I can attest to its full rich tone, and how easy it is to play. "The guitar was too cool to not build," Powers said. Looking to the future, Taylor announced the release of TaylorSense®, a revolutionary new technology that puts the health and vital signs of a Taylor Guitar directly into the owner's hands. TaylorSense integrates the guitar's hardware with mobile software to help players better care for their instrument and get the most out of playing it. Anchored by the TaylorSense smart battery box (which replaces the 9-volt battery box in any acoustic Taylor guitar), the box houses sensors that monitor the condition of the guitar and communicates via low-energy Bluetooth to the free Taylor Guitars iOS App. For more information about this product, its release date this spring, visit www.taylorsense.com. Getting to the Winter NAMM Show early is always a good idea. While the Anaheim Convention Center doesn't generally open until around 10 a.m., making a point of hitting the show's opening "Breakfast of Champions" seldom disappoints. On the official opening day of this year's show, the surprise musical guest was Jake Shimabukuro. A true ukulele virtuoso, he blended elements of rock, blues, jazz, funk, classical and flamenco during a set that included reworkings of rock classics and original compositions. Highlights included a jaw-dropping take on Queen's "Bohemian Rhapsody" and inspired set-ending arrangement of George Harrison's "While My Guitar Gently Weeps." 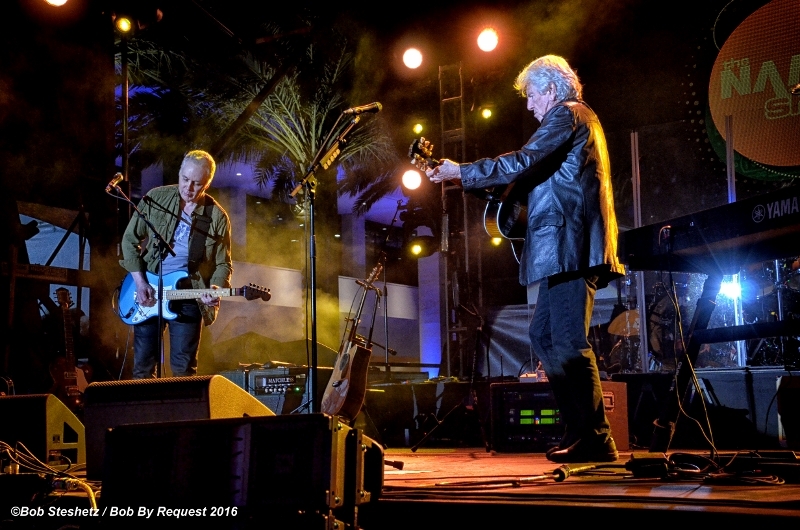 After the stunning performance from Shimabukuro, NAMM's President and CEO Joe Lamond presented singer-songwriter Graham Nash (The Hollies; Crosby, Stills & Nash) with the "Music for Life" award. "The fact is that when music is a part of the school program students are less liely to join a gang, less likely to get into trouble, feel better about themselves and get better grades," Nash said. "So let's keep music in schools." Thursday saw a number of other solid performances that played out. One of the first performances I caught featured banjo virtuoso Mark Johnson and guitarist-mandolin player Emory Lester playing a satisfying set at the Deering Banjo Company booth. Their long set of instrumentals allowed each to showcase their skills, and a potent version of "Will You Miss Me When I'm Gone." 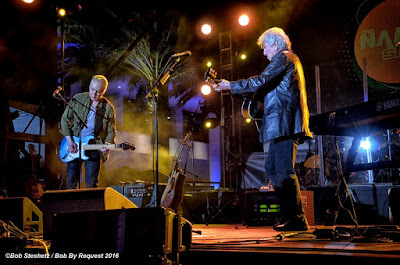 Fingerstyle guitarist Laurence Juber is a regular visitor to the NAMM Show and always attracts good-sized audiences to see him perform a wide range of material showcasing his technical skill on his Martin guitar. Performing at Hal Leonard, he showcased material featured in "DADGAD Solos," a book now available now featuring his original transcriptions. Highlights included a tender version of Del Shannon's "Runaway," the Beatles' "Yesterday" and "Georgia On My Mind." He also performed a shining original, "Cobalt Blue," allowing him to showcase his own skills as a composer. with Trey Hensley at Taylor Guitars on Jan. 21, 2016. Taylor hosted a number of concerts each day of NAMM and I made it a point to catch as many as I could. Thursday afternoon featured the one-two guitar punch from siblings Chelsea and Grace Constable, who played a rousing set of bluegrass-meets-gypsy jazz instrumental prowess. Trading leads and displaying an obvious sense of fun throughout their set, highlights included the jazzy "Burning Steam," Americana-styled "Dad's Song" and an incredible version of Dire Straits'"Sultans of Swing." Taking a well-deserved encore, the Constables they were joined by singer-guitarist Trey Hensley for a rousing version of the blues standard "Mystery Train" and a set-ending take on the Johnny Cash classic "Folsom Prison Blues." 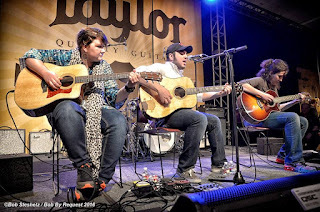 Following the sisters' impressive NAMM debut, Hensley performed a solo set that showcased the Nashville-based artist's love of traditional country music and bluegrass. Highlights of his short set included a beautiful self-penned ballad "That's What Leaving's For" (set to be included on his next album) and an energetic take on Merle Haggard's "Mama Tried." He closed his set with a cover of Jimmy Martin's "Freeborn Man," with his dazzling arrangement even including a bit of John Lennon's "Norwegian Wood" thrown into the solo. Thursday night, Nash was the featured performer on the Grand Plaza Stage. In addition to featuring some of his best-known hits from the Hollies and CSN, he also played several songs off his forthing album This Path Tonight, set for release on April 15. Nash performed with CSN guitarist Shane Fontayne. Opening with melodic rendition of the Hollies' 1966 hit "Bus Stop," Nash acknowledged the audience after the song: "That was a long time ago." Nash continued to mine the past and went on to deliver a dream set of material, often providing the background on what led to some of his most famous songs. "Marrakesh Express," "Our House," "Fieldworker," "Immigration Man" and others benefited from the mix of storytelling and song. The strongest single performance of the night came when Nash went to the piano and, after recalling how David Crosby got him to come along on an extended sailing trip, he performed "Wind on the Water," a beautiful moment that brought a sense of stirring emotion throughout the crowd standing in front of the stage. Among the new songs from his upcoming "This Path Tonight" was "Golden Day," a song where he celebrates life now and the everyday joys that overcome the world's obvious challenges. Another new song, "Myself At Last," also tapped into that optimistic tone. James Grey is one of several Orange County-based artists I made a point of catching on Saturday. A talented songwriter and guitarist, he sang a number of songs while utilizing the talents of guitar great Bob Hawkins. Grey's songs often blend soul, rock, pop and Americana, with the specific art of songcraft always anchoring his originals. "Seabreeze" and the soulful "Home" were among the standouts featured in his 33-minute set that played out on the Hilton Stage. John and Jacob tearing it up at Taylor Guitars. John & Jacob were impressive when I saw them perform at Stagecoach Festival in Indio in 2015, but the quintet simply blew me away when I caught their set at Taylor Guitars. 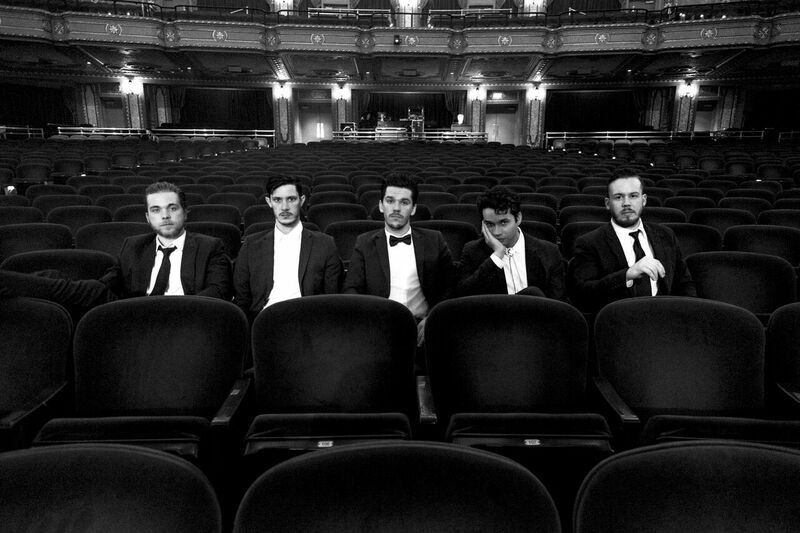 Somehow coming across as a masterful blend somewhere between Arcade Fire, Mumford and Sons and the Everly Brothers, the Nashville-based group includes singer-guitarist John Davidson, singer-guitarist-trumpet player Jacob Bryant, singer-guitarist-keyboardist Austin T. Smith, bassist Jake Thrasher and drummer Trevor Davis. Among the songs that impressed me (along with everyone else yearning for more in Taylor) was the anthemic opener "Coming Back For You," the country-leaning rocker "Done," and driving country-meets-rock harmonies-filled standout "Give It Away" that closed the outstanding set. 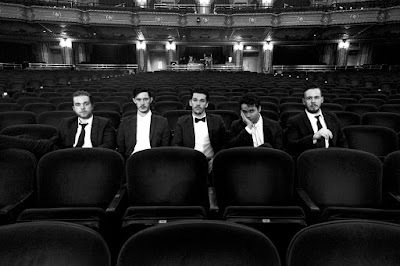 Learn more about this exciting ensemble here: http://johnandjacob.com. Michael Ubaldini is rightfully considered a leader of the regional Americana scene, having long ago mastered how to blend rockabilly, pop, folk, country blues and other roots styles together in the service of his intelligent songs. Over the course of 45 minutes on the Sheraton Acoustic Stage, Ubaldini used nothing more than an acoustic guitar, harmonica and his potent vocals in the delivery of gems such as the rousing "Jean Harlow," pensive "Shadows and Ghosts" and blistering "Scratch My Back." Music lovers have a wealth of new releases to celebrate including David Bowie's inspired Blackstar and a number of new multi-format titles now available. Tell me more: David Bowie celebrated his 69th birthday on January 8, 2016 with the release of his 25th studio album Blackstar. Only two days later the legendary artist was dead following an 18-month fight against cancer. Whether it was his Ziggy Stardust alter-ego and "Berlin era" masterworks that gave rise to classics such as “Heroes” or his 1983 commercial return “Let’s Dance” and seminal hard rock foray Tin Machine, Bowie was never one to repeat himself. And that couldn’t be more true than the sonic territory explored across Blackstar. Masterfully blending rock, jazz, art damage and electronica, Bowie has left the world with a final masterpiece. This is an album that reveals its moods, textures and depths with each new listen. The ambitious 10-minute title track, stunning "Lazarus" and propulsive disc-ending "I Can't Give Everything Away" are among the instantly-affecting songs. Information: davidbowie.com. Tell me more: About the Young Idea is a package that gets it right. Chronicling the Jam's story via a great 90-minute documentary as well as a wealth of bonus features and a previously-unreleased concert film (a 1980 performance on Germany's "Rockpalast"). The story of singer-guitarist Paul Weller, bassist Bruce Foxton and drummer Rick Buckler is fully delivered via classic footage and photos, as well as historic and recent interviews with the members of the band, producers, journalists and fans. The second disc of the collection features a 80-minute appearance notable for the potent delivery of one driving rocker after another, the trio's energy and power is showcased via the formidable "Going Underground," wistful "Private Hell," melodic folk rocker "Liza Radley" and confessional "But I'm Different Now." About the Young Idea is available on Blu-ray, DVD, as a deluxe edition (which includes a 40-page hardback book, two DVDs and an audio CD featuring the 1980 "Rockpalast" concert) and via digital. Information: eagle-rock.com. Tell me more: Both players and lovers of the bass guitar recognize Jaco Pastorius with the same level of respect that electric guitar aficionados hold Jimi Hendrix. Now the story of Pastorius is celebrated via Jaco, an important movie produced by Metallica bassist (that fills disc one) Robert Trujillo, as well as ancillary materials including interviews with Joni Mitchell, Carlos Santana, Geddy Lee, Bootsy Collins, Flea and historic performance footage to shed light as part of a much-deserved tribute to the legendary Pastorius (who passed away in September 1987 at the age of 35). "Jaco" is available on Blu-ray or DVD. Information: MVDb2b.com. Tell me more: Few rock guitarists loom larger than Ritchie Blackmore. A talented and highly-influential guitar great who was a skilled studio player in the 1960s before joining Deep Purple and leading Rainbow in the '70s and '80s, the 70-year-old English musician has since gone on to enjoy a second career as a Renaissance-styled folk project Blackmore's Night. On the newly-released The Ritchie Blackmore Story (available on DVD, Blu-ray and digital, as well as a deluxe edition), Blackmore life and work is explored with interviews with the guitarist as well as a long list of illustrious admirers including Brian May (Queen), Steve Lukather (Toto), Glenn Hughes (Deep Purple), Jon Lord (Deep Purple) and many others, along with classic performance clips. Information: eagle-rock.com. Tell me more: The aptly-titled The Man, The Music is a documentary that looks at progressive rock guitarist Steve Hackett's rich life and career, which includes his key role as a member of Genesis (including during the recording of "Selling England by the Pound" and "The Lamb Lies Down on Broadway), and through recent times with his own "Wolf Light" and the Genesis Revisited project. "The Man, The Music." features archive and recent interviews with Hackett, as well as rock notables including Steven Wilson (Porcupine Tree), Chris Squire (Yes) in one of his final filmed interviews and long-time producer Roger King. Of special interest to guitarists is an intimate look as Hackett reveals some of his electric and acoustic guitar techniques. Information: wienerworld.com. Tell me more: Deadheads from all over the globe flocked to Chicago's Soldier Field in late June and early July 2015 to catch the surviving four core members of Grateful Dead (Mickey Hart, Bill Kreutzmann, Phil Lesh and Bob Weir) join forces with Phish frontman Trey Anastasio, Bruce Hornsby and Jeff Chimenti to perform as part of a 50-year anniversary celebration of the Palo Alto-spawned Grateful Dead. Now the final show of that so-called Fare Thee Well concert (staged on July 5, 2015 and almost 20 years after the death of Jerry Garcia) is out as a deluxe 2 DVD/3 CD set. "Fare Thee Well" includes the complete 18-song concert, with stunning 5.1 surround and stereo audio mixes bringing the magic of the concert to the home theater in full-fledged fashion. Classics performed include "China Cat Sunflower," "Truckin'," and "Touch of Grey." Information: dead.net and rhino.com. LOS ANGELES - In 1978, the Cars had a Top 40 hit with the band's very first single, "Just What I Needed." That streak continued over the next 10 years, as the band revisited the Top 40 a dozen more times with radio hits "Let's Go" and "Shake It Up" along with iconic videos like "Magic" and "You Might Think," which won MTV's first-ever "Video Of The Year" award in 1984. The five original members - Ric Ocasek, the late Benjamin Orr, Greg Hawkes, Elliot Easton and David Robinson - recorded six studio albums together - all of them with Elektra Records - and have sold more than 23 million albums in the U.S. alone. Rhino will release two new collections in the spring to honor The Cars' vast musical legacy. The first is a boxed set featuring all six of the band's Elektra studio albums. The second is a single-disc, career-spanning collection curated by The Cars that combines the group's best songs along with a trio of rare and unreleased alternate versions. THE ELEKTRA YEARS 1978-1987 includes six studio albums, each one presented in a replica sleeve with original artwork. Ric Ocasek oversaw digital remastering for the set, while drummer David Robinson - who helped create The Cars' iconic album covers through the years - served as art director. The six-disc collection will be available March 11 on CD ($39.98) and digitally. On Tuesday June 7, a limited edition vinyl version of the boxed set will be available with each 180-gram LP pressed on a different color vinyl. 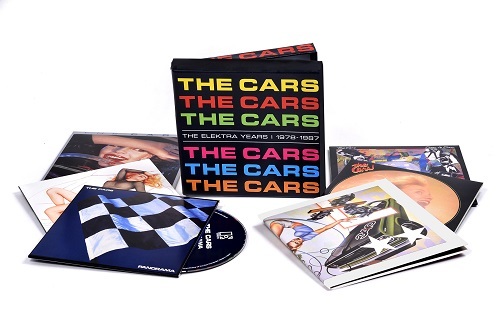 The extensive set retraces the band's musical journey in the studio and includes: The Cars (1978),Candy-O (1979), Panorama (1980), Shake It Up (1981), Heartbeat City, (1984) and Door To Door (1987). Among the 60 tracks are the band's biggest hits - "My Best Friend's Girl," "Good Times Roll," "You Are The Girl," and "Drive." MOVING IN STEREO: THE BEST OF THE CARS will be available on May 6 on CD ($18.98) and as a 2-LP set on 180-gram vinyl ($34.98). The collection is produced by the band, with all surviving members contributing to song selection. Ocasek also supervised digital remastering of all the audio with Ted Jensen at Sterling Sound. The collection features the band's big hits along with a rare, single mix for "I'm Not The One," as well as a live version of "Everything You Say," and a new mix by producer Philippe Zdar of "Sad Song," a track from the band's last album, 2011's Move Like This. 1. "Just What I Needed"
8. "My Best Friend's Girl"
9. "Don't Tell Me No"
10. "You're All I've Got Tonight"
2. "My Best Friend's Girl"
3. "Just What I Needed"
4. "I'm In Touch With Your World"
6. "You're All I've Got Tonight"
2. "Since I Held You"
3. "It's All I Can Do"
8. "You Can't Hold On Too Long"
10. "Got A Lot On My Head"
11. "Dangerous Type" 1. "Hello Again"
7. "It's Not The Night"
8. "Why Can't I Have You"
4. "Don't Tell Me No"
8. "You Wear Those Eyes"
10. "Up And Down" 1. "Leave Or Stay"
2. "You Are The Girl"
6. "Ta Ta Wayo Wayo"
9. "Wound Up On You"
Show in Anaheim last week. Cheap Trick to release lead track "No Direction Home"
Legendary power-pop collective Cheap Trick set a new course with "No Direction Home," from their upcoming album Bang Zoom Crazy...Hello, due out April 1, their first on Big Machine Records. Pulsating riffs intertwine with the anthemic chorus in this first taste of new music in over five years from the iconic four-piece from Rockford, IL. Fans can pre-order the album beginning March 4 and listen to the first track here. Bang Zoom Crazy...Hello follows the recent announcement about the band's forthcoming induction into the Rock And Roll Hall Of Fame. The long-awaited news celebrates the pioneering sound that has lead to sales in excess of 20 MILLION and more than 40 international GOLD and PLATINUM certifications for their multi-award winning back catalogue. 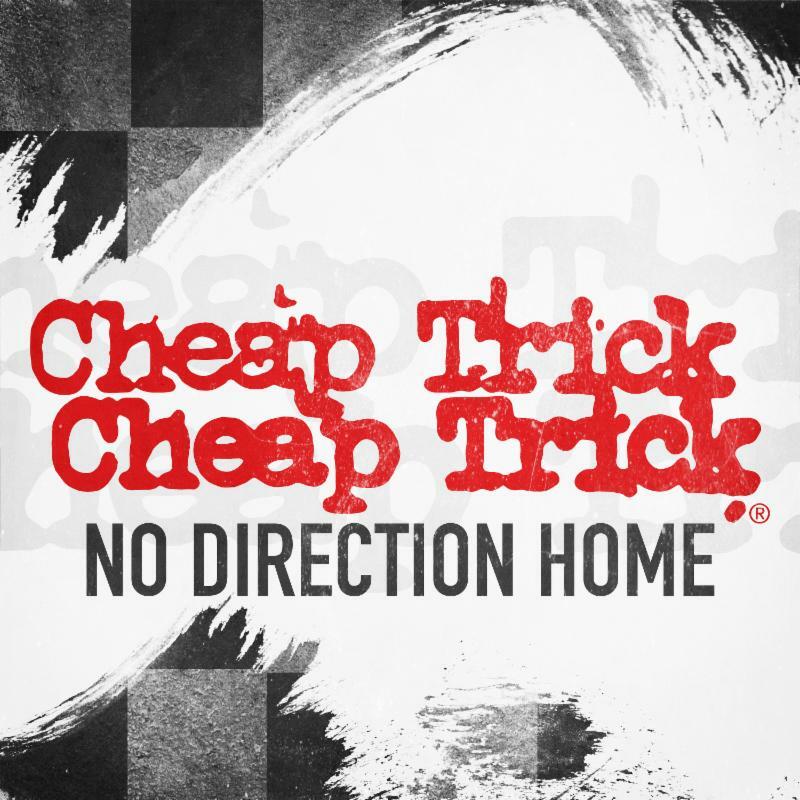 Cheap Trick's music has also been featured on more than 20 major feature film soundtracks. Now into their fourth decade of recording, Bang Zoom Crazy...Hello marks Cheap Trick's 17th studio album and was produced by GRAMMY award-winning producer Julian Raymond. Firmly cemented as one of the most important bands in music history, the quartet will continue their reign as the top progenitors of power-pop through 2016 and beyond with the release of Bang Zoom Crazy...Hello. Cheap Trick are an indisputable American institution, beloved around the globe since 1974 for their instantly identifiable, hugely influential, brand of pop rock 'n' roll. The band - Robin Zander (vocals, rhythm guitar), Rick Nielsen (lead guitar), Tom Petersson (bass guitar), and Daxx Nielsen (drums) - are truly one-of-a-kind pioneers with an unparalleled streak of certifiably classic tunes such as "Surrender," "I Want You To Want Me" and "Dream Police." Famous for having played over 5,000 shows in their career, Cheap Trick will hit the road again this summer in support of Bang Zoom Crazy...Hello and to celebrate their induction into the Rock And Roll Hall Of Fame. The band will kick off the "Rock Hall Three For All" tour of the US alongside Heart and Joan Jett & The Blackhearts, beginning July 14 at the DTE Energy Music Theatre, Michigan. The 30-date tour will culminate at Florida's Perfect Vodka Amphitheatre on September 23. Full Cheap Trick tour dates can be found at cheaptrick.com/tour-dates. 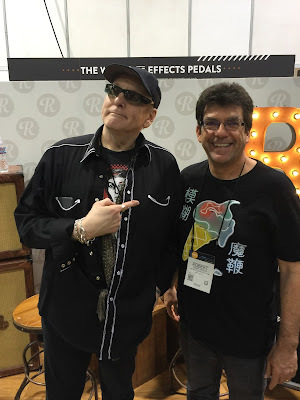 TJR and I have started posting our video coverage from the 2016 NAMM Show. Enjoy everybody! First, watch part 1 of our annual roundup featuring product news, interviews and live performances. 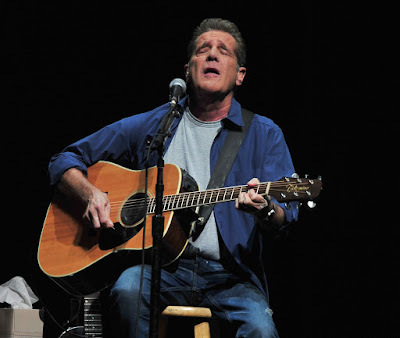 Glenn Frey performing at the Forum in Los Angeles in 2014. January 2016 is proving to be a difficult one for music fans. While the world continues to mourn the death of David Bowie last week, we are now just as suddenly and sadly impacted with the tragic news that Eagles guitarist-singer Glenn Frey has died. He was only 67. Frey was an original and founding member of the band, and co-wrote beloved hits including "Take It Easy" and "Hotel California." "Glenn fought a courageous battle for the past several weeks but, sadly, succumbed to complications from Rheumatoid Arthritis, Acute Ulcerative Colitis and Pneumonia," according to a statement on the band's official Web site. "Glenn was the one who started it all," wrote Eagles bandmate Don Henley. The two met in 1970 and went on to form one of rock's most popular and enduring groups. "He was the spark plug, the man with the plan. He had an encyclopedic knowledge of popular music and a work ethic that wouldn't quit. He was funny, bullheaded, mercurial, generous, deeply talented and driven." Ringo Starr (via his Twitter feed): "God bless Glenn Frey peace and love to all his family and friends"
– Travis Tritt has released a statement regarding the passing of his longtime friend, founding member and guitarist of the Eagles, Glenn Frey. Tritt commented, "Glenn Frey and the music he created alone and with The Eagles have been such an inspiration to me. We first met at the video shoot for my version of ‘Take It Easy’ in 1993. He always went out of his way to acknowledge and encourage me ever since. I'm a better person, better musician and a better songwriter having met him. I still can't believe he is gone!" Tritt’s 1993 release of Eagles’ “Take It Easy” led to a reunion of the famously acrimonious band as they came together to appear in the music video. The meeting led to reconciliation and the band put aside their differences, eventually reuniting for their 1994 Hell Freezes Over tour. As a founding member of the Eagles, Glenn Frey was an integral part of one of the most storied bands in pop history. His songwriting, especially with bandmate Don Henley, resulted in some of the biggest hits and standards of the ’70s, including songs like "Desperado," "One Of These Nights," "Lyin’ Eyes," and "Hotel California." The latter two earned the Eagles two of their six GRAMMY Awards. Desperado and the milestone album Hotel California, along with its title track, have been inducted into the GRAMMY Hall OF Fame. The band’s Their Greatest Hits: 1971-1975 remains one of the best-selling albums of all time, a testament to the enduring music that Glenn played a significant role in creating. Glenn’s untimely passing is a huge loss for the music community, and we offer our condolences to his family, friends, colleagues, and fans. Watch the new episode of MUSIC WORTH BUYING where Robert and TJR discuss David Bowie's Blackstar. NAMM preview: Michael Ubaldini, Graham Nash, Taylor Guitars performances, Dr. John, the Young Dubliners, more! This post will be of specific interest to musicians, music industry insiders and others who have badges and are confirmed to be attending the upcoming NAMM Show in Anaheim, Jan. 21-24, 2016. If you don't have credentials, you will not be able to get inside the NAMM Show. at the NAMM Show on Saturday, Jan. 23. 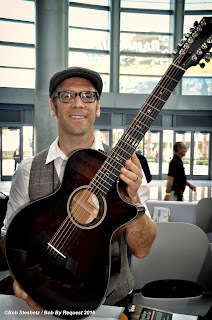 Before I get into some of the more high-profile events unfolding at the NAMM Show, I didn't want to forget to highlight a special acoustic appearance by Orange County-based singer-songwriter-guitarist Michael Ubaldini. The acclaimed alternative-Americana hero will be performing a special free concert on the Sheraton Acoustic Stage inside the Sheraton from 11 - 11:45 p.m. on Saturday night, Jan. 23. Recovering from a serious illness, this anticipated live set will mark Ubaldini's first performance since September 2015. You can see my review of his most recent album Songster here. 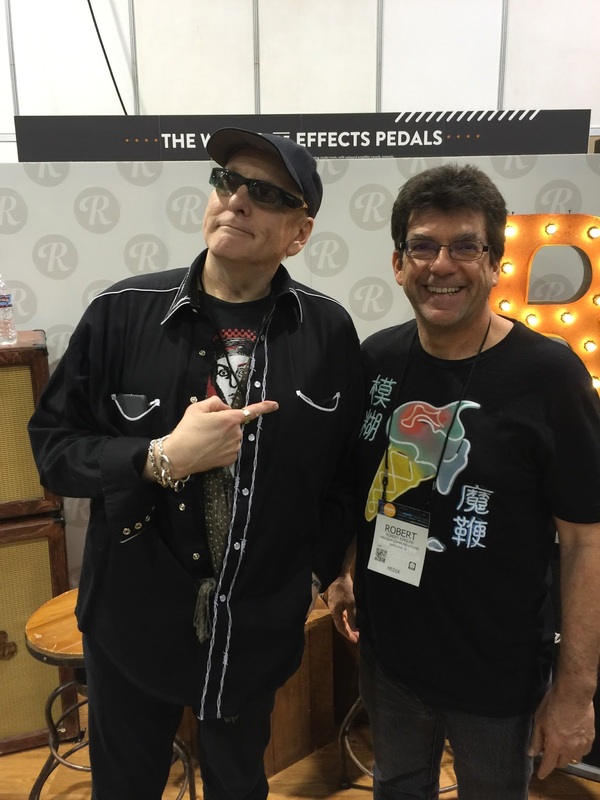 I am looking forward to seeing him back in action at NAMM next week! on Thursday evening, Jan. 21, 2016. Each night from 6-7:30 p.m. on the NAMM Nissan Grand Plaza Stage,check out iconic artists noted for shaping their musical eras and genres. 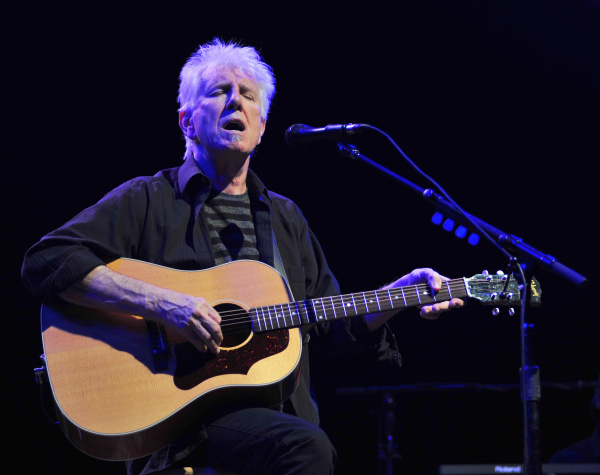 Immediately following the Industry Tribute on opening night, legendary singer-songwriter Graham Nash will take the stage for an Evening with Graham Nash. Friday night The NAMM Foundation and The John Lennon Educational Tour Bus present The Imagine Party featuring Dr. John & the Nite Trippers. Celebrate music education with the Rock and Roll Hall of Famer and six-time GRAMMYTM winner Dr. John, for a live performance co-hosted by OWC, Neutrik USA, Genelec, Securematics and Juniper Networks. On Saturday night (Jan. 23), the Grand Plaza Stage will host a "Legends" concert from 6-7:30 p.m. feature Bill Champlin (Chicago), Bobby Kimball (Toto), Dennis Tufano (The Buckinghams), Chuck Negron (Three Dog Night), Jimy Sohns (Shadows of the Knight), Spencer Davis (Spencer Davis Group) and other guest artists joining forces to perform. Taylor Guitars is pleased to announce its artist lineup for the 2016 Winter NAMM Show in Anaheim, California. This year brings bluegrass and fingerstyle sensations, international singer-songwriters, and accomplished country music artists to the company's showcase. Kicking off the show on Thursday, January 21, is instrumentalist, Matteo Palmer. Palmer's passion for guitar began after seeing fingerstyle virtuoso Alex De Grassi perform live, and he soon reached out to Grammy-winning guitarist and producer Will Ackerman to pursue his music further. At age 17, Palmer recorded his debut album Out of Nothing at Ackerman's Imaginary Road Studios, and he's currently at work on his follow-up with Ackerman again at the production helm. Palmer will be followed by Grace and Chelsea Constable.The sisters started playing guitar when they were 9 and 10, respectively, and quickly grew into a powerfully dynamic sibling duo. Grace, now 13, has just completed writing, arranging and producing her debut CD, while Chelsea has been featured in many major guitar publications, and at 13 closed the show at Muriel Anderson's All-Star Guitar Night and Steve Morse. Chelsea is also finishing her debut EP and plans to release it later this year. Closing out Thursday night will be Grammy-nominated guitar player, singer and songwriter Trey Hensley. Hensley has made a name for himself in bluegrass and country circles, performing at the Grand Ole Opry at age 11, and sharing the stage with the likes of Marty Stuart, Earl Scruggs, Johnny and June Carter Cash, Charlie Daniels, Steve Wariner, The Oak Ridge Boys, and many others. In the summer of 2013, Hensley relocated to Nashville and started playing regularly with the International Bluegrass Music Association's 15-time Dobro Player of the Year, Rob Ickes. The duo is currently nominated for a Grammy in the category of "Bluegrass Album of the Year" for their 2015 release Before the Sun Goes Down. Taylor Room on Friday, Jan. 22. 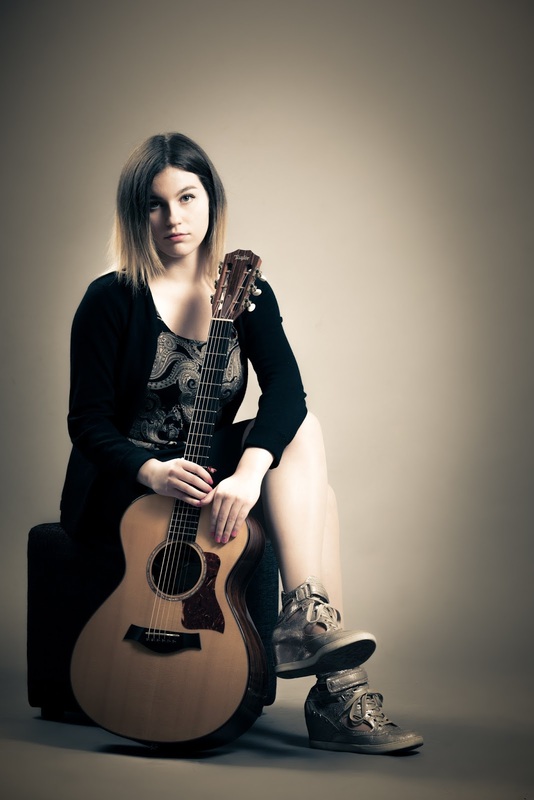 On Friday, Swedish fingerstyle guitarist Gabriella Quevedo will take the stage. The daughter of an Argentinean guitarist, Quevedo began her career after being inspired by the fingerstyle players she saw on YouTube. Eventually she started uploading her own videos, which have garnered nearly 40 million views. She was also featured on Guitar World's website for her arrangement of the Eagles' "Hotel California," during which she played the vocal melody, guitar, bass line, and some percussion. Quevedo will be followed by singer-songwriter sensation James TW. The British-born 18-year-old also gained notoriety through YouTube on the strength of his unique sound and deft guitar playing. He was recently signed to Island Records and counts pop sensation Shawn Mendes as a fan of his playing. Saturday evening will welcome three members of the Zac Brown Band; John Driskell Hopkins, Clay Cook, and Daniel de los Reyes. Hopkins is a founding member of the Zac Brown Band and co-writer of such hits as "Toes," "Goodbye in Her Eyes," and the band's first mainstream rock hit, "Heavy Is The Head," which featured former Soundgarden frontman Chris Cornell. Cook boasts an equally impressive musical background. As a student at the Berklee College of Music, Cook co-founded the Lo Fi Masters with Berklee classmate and future star John Mayer. 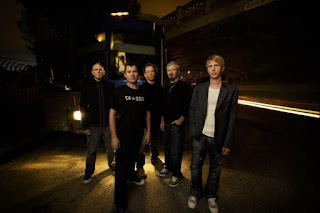 Cook has also played with the likes of Sugarland and the Marshall Tucker Band. He joined Zac Brown in 2011, while continuing to periodically release new material under his own name. Daniel de los Reyes joined the group in 2012. Prior to, he toured with acts among the likes of Jimmy Buffett, Sheryl Crow, Gloria Estefan, Peter Frampton, the Killers and Sting. on Saturday afternoon, Jan. 23. Following the country jammers will be John and Jacob, a pop/rock band comprised of John Davidson, Jacob Bryant, Trevor Davis, Jake Thrasher and Austin Taylor Smith. In 2015, they toured with country artist Kacey Musgraves and hit the festival circuit, performing at SXSW, Shaky Boots, Stagecoach, and the CMA Music Festival. Evidence of John and Jacob's success appears across the music scene: They co-wrote the hit single, "Done." with The Band Perry, which has sold over 1 million copies; their songs "Be My Girl" and "Breaking the Law" were featured on the hit TV show Nashville; and their self-titled debut album premiered on the Top 10 Billboard Heatseeker Charts. Fans attending the NAMM Show are welcome to view the performances live by visiting the Taylor Room located at 213 ABC. 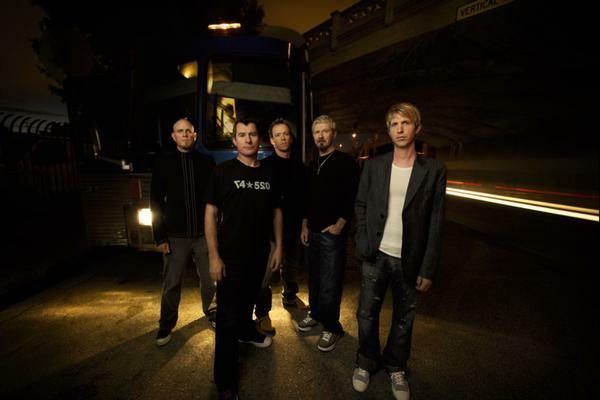 The Young Dubliners will perform at NAMM. Among the other artists now confirmed to be performing as part of the NAMM Show are Irish music rockers The Young Dubliners (performing at 11:59 p.m.on Thursday night on the Anaheim Marriott Stage), genre-defying multi-instrumentalist Trevor Green (on the Grand Plaza Stage at 1 p.m. on Friday, Jan. 22), and acclaimed singer-songwriter James Grey (performing solo on the Anaheim Hilton Stage from 2 - 2:45 p.m. on Saturday, Jan. 23). And it is always great to catch legendary fingerstyle guitarist Laurence Juber (a one-time member of Paul McCartney's Wings) performing in the intimate setting of NAMM. He is scheduled to perform a trio of sets at the show on Thursday afternoon, Jan. 21. Click here to see where you can catch him at NAMM. Click here for an impressive schedule of all the forthcoming special events and performances coming to NAMM next week! The National Association of Music Merchants (NAMM) is the not-for-profit association with a mission to strengthen the $16.6 billion music products industry. 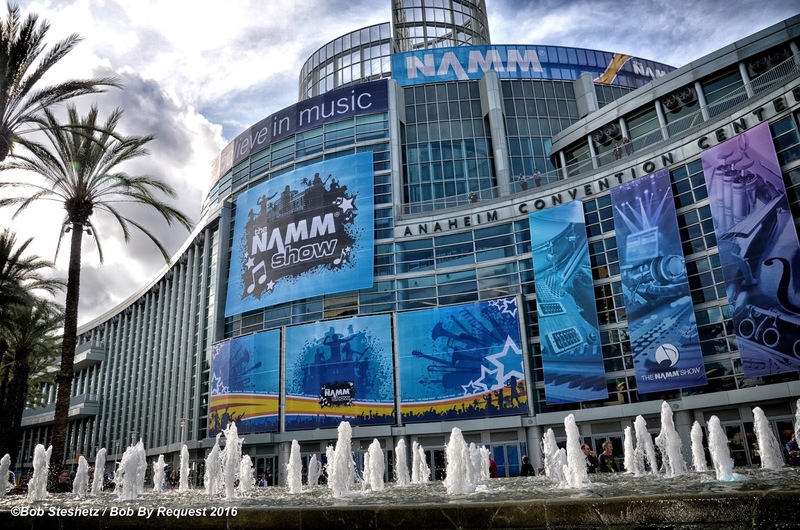 NAMM is comprised of approximately 10,300 member companies located in 102 countries and territories. NAMM events and members fund The NAMM Foundation's efforts to promote the pleasures and benefits of music, and advance active participation in music making across the lifespan. For more information about NAMM, please visit www.namm.org, call 800.767.NAMM (6266) or follow the organization on Facebook, Twitter and YouTube.